Hello from Whitehorse, Yukon Territory! 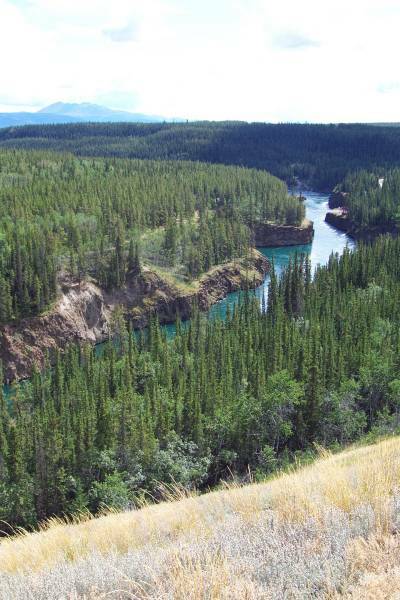 I arrived in the Capitol of the Yukon Territory this afternoon, and decided to stop since I needed to buy some things and wash my clothes. 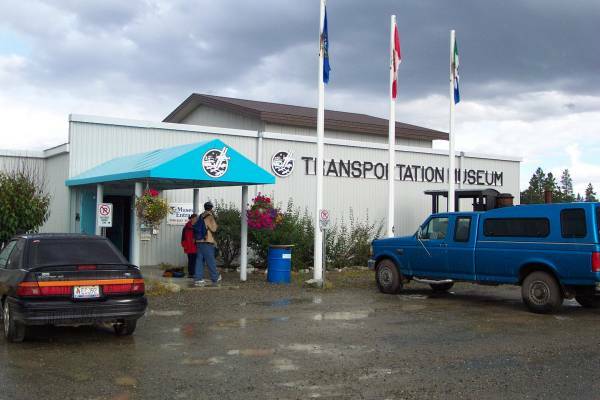 I also was very interested in seeing their transportation museum. This is an interesting town with a population of approximately 20000. There is a pretty downtown area to walk through, as well as an interesting waterfront. There was a bit of rain, and a power outage during my Chinese dinner, but the power was back on in reasonable time, and the skies are clearing. After a decent night of sleep, I was ready to continue my journey. The morning started off cloudy, and the temperature was 45 F. The highway was clear, as I usually find it in the mornings, and I drove to my first planned stop, Rancheria Falls. 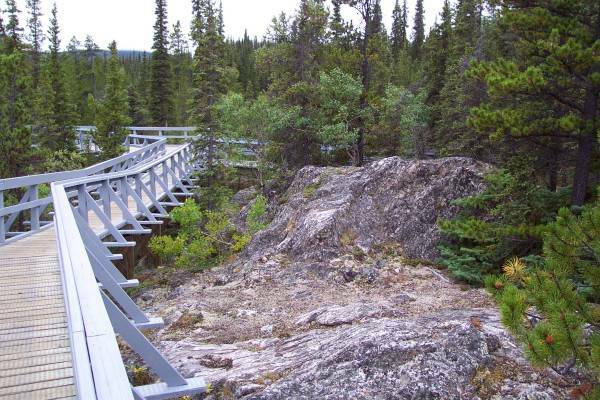 An easy trail has been constructed to the falls, one which allows handicap access. The falls were just a few minutes away, and were very pretty. I met a couple along the way named Lorna and Jim. They are driving to Alaska over a three week holiday from Wisconsin, and were on day four of their journey. 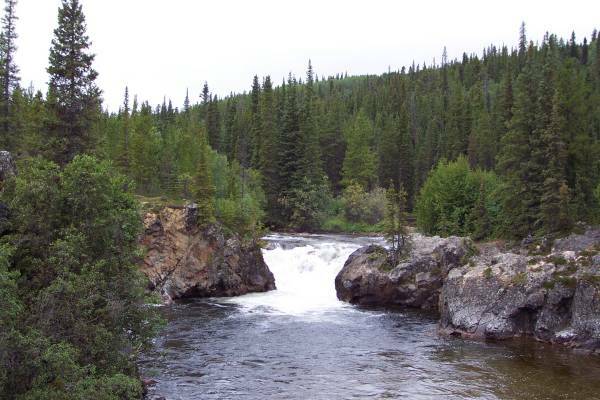 Jim had stopped at several waterfalls during the drive to try to catch fish, but had no luck, and was not catching anything at Rancheria. As I was walking back to the parking lot, I met up with them again. 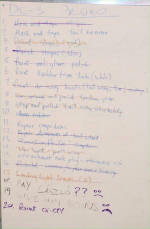 Jim was going to try another rod. He will have many opportunities along the way! 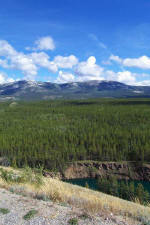 I continued northwestward, and had more wonderful views, including snow capped mountains, as the clouds began to clear. 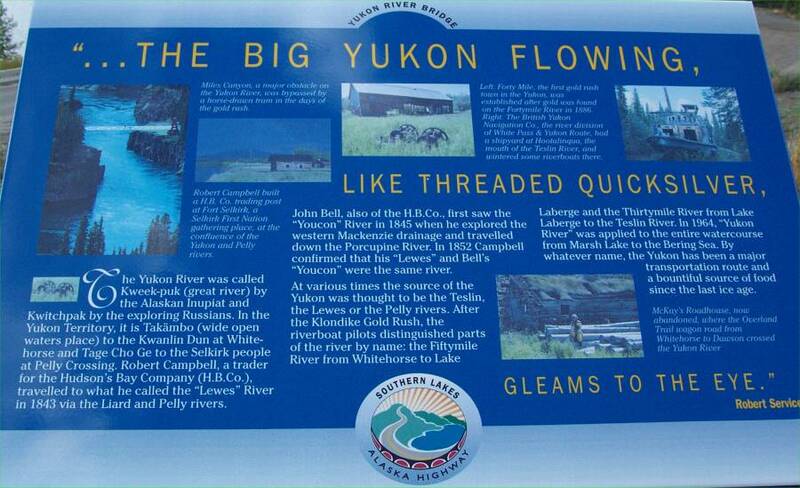 This lead me to the town of Teslin, and a visit to the George Johnston Museum. George was a Tlingit Indian, and was also an avid photographer. His pictures, personal belongings, Tlingit ceremonial robes and artifacts, and stories of his life are on display a the museum. It is an interesting place to visit and learn about the early settlers of the region. George also brought the first car to the town, before there were roads. He, with the assistance of several others, cleared a path to a nearby settlement. He also used it on the lake nearby in the winter, and as a taxi. The weather had been improving throughout the day, with partly cloudy skies and temps in sixties. 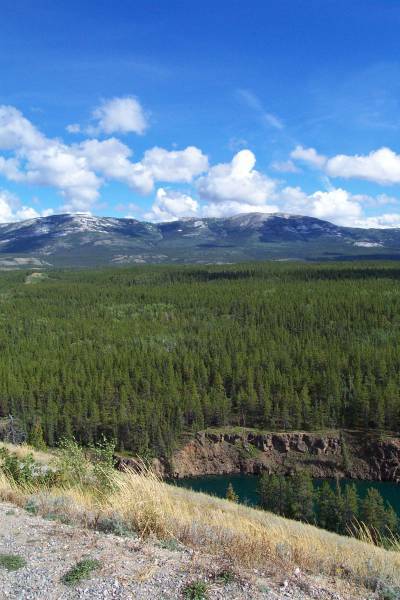 It was beautiful for my visit to Miles Canyon, just south of Whitehorse, where the Yukon River passes. 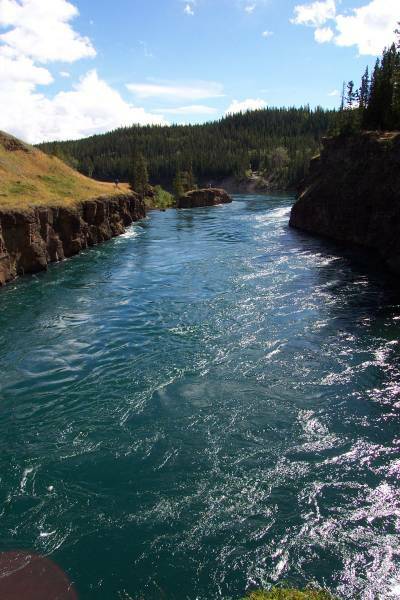 The current is very strong there, and trailside displays mentioned of the need for specially trained pilots to steer boats through the canyon. 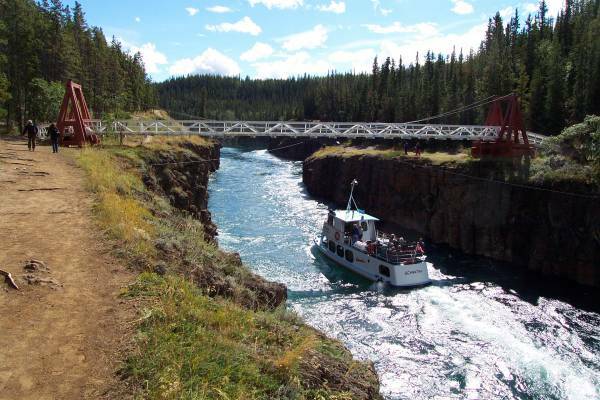 To enhance the site, a pedestrian suspension bridge crosses the canyon. Also, boat rides are available form a company downstream. 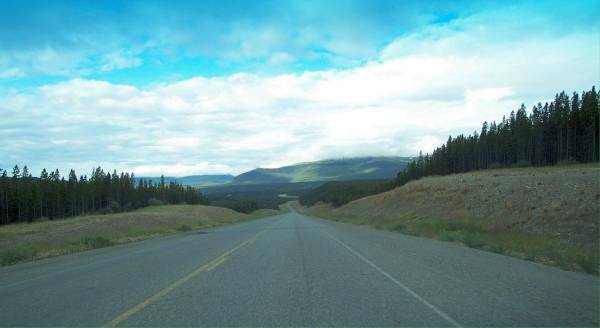 This leads me to my entry into Whitehorse. I was in need of a CD burner, and it was time to do laundry, so I decided to stop for the night. 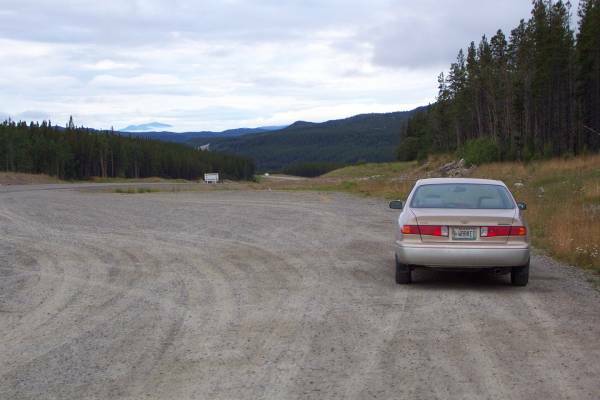 After checking into a motel, I went to the Whitehorse Airport, where next door is the location of the Yukon Transportation Museum. 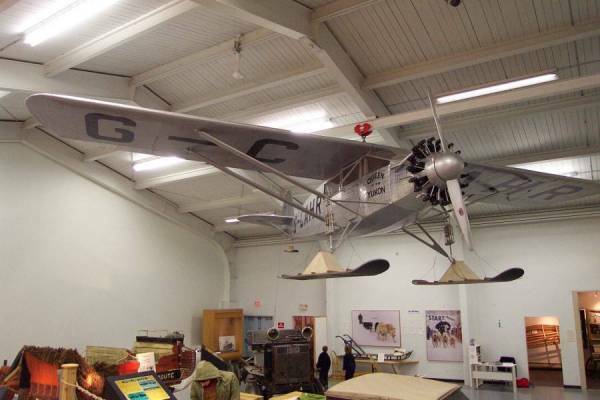 I found it to be a very interesting place, especially the displays for aviation. 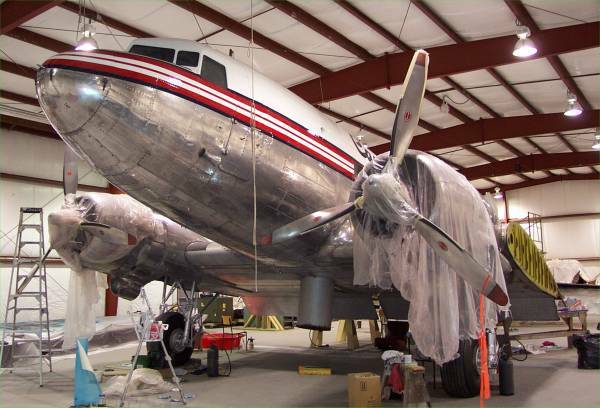 The Museum has a DC-3, which was in a hanger being refurbished. They use this aircraft as a wind vane by placing it balanced on a pole. It needs only a 5 knot wind to turn it! 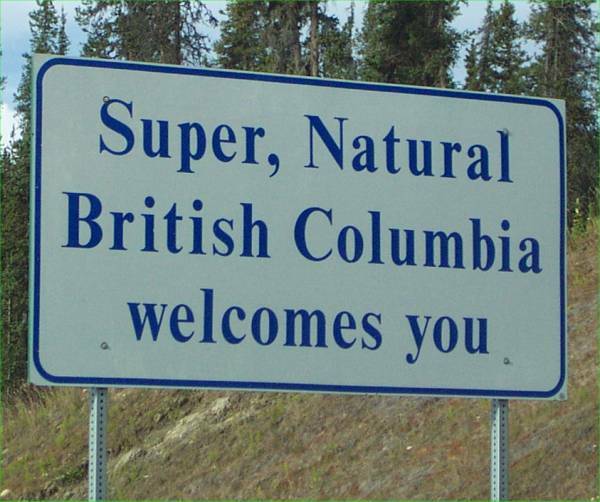 They may have it installed by the time I return to Whitehorse. As I was doing my laundry, I noticed an ad for a log cabin wired for the internet. I stopped by and was able to get a DSL connection, my first fast connection in six weeks! Since then I have not had access to a phone. I will post this as soon as possible. 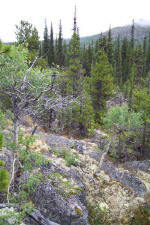 Along the trail to Rancheria Falls. This is the walkway built to allow access to the falls. 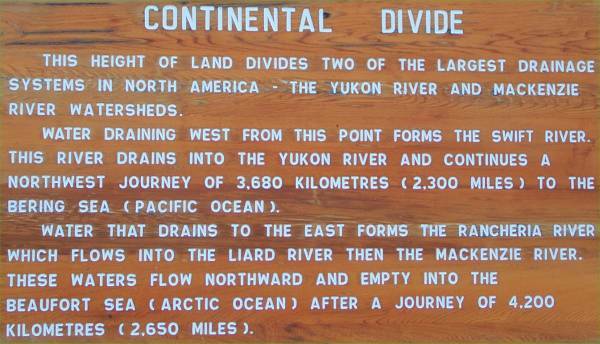 The next three pictures were taken at a roadside pullout, the location of the Continental Divide on the Alaska Highway. More information about the divide. A view of the pretty scenery. 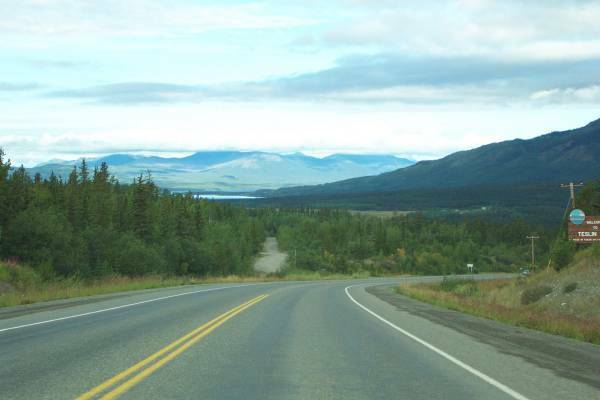 This is the approach to Teslin, with another wonderful view! 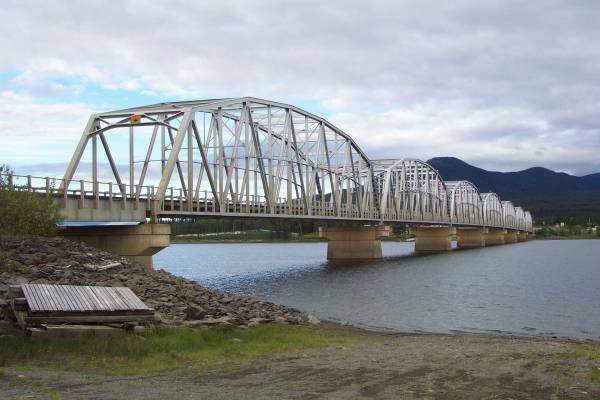 The interesting Nisutlin Bay Bridge by Teslin Lake. 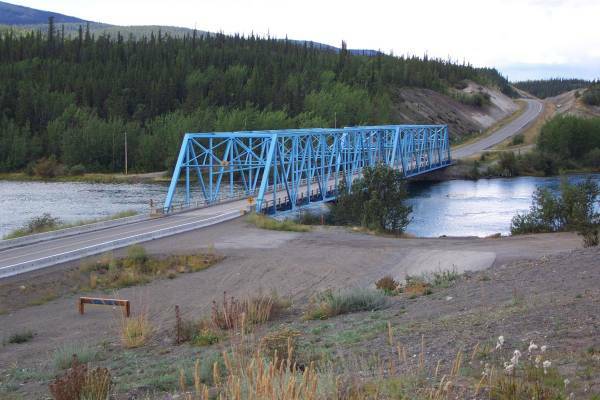 The bridge, 1917 feet in length, is the longest bridge on the Alaska Highway. Informative panel about the Teslin migration route. 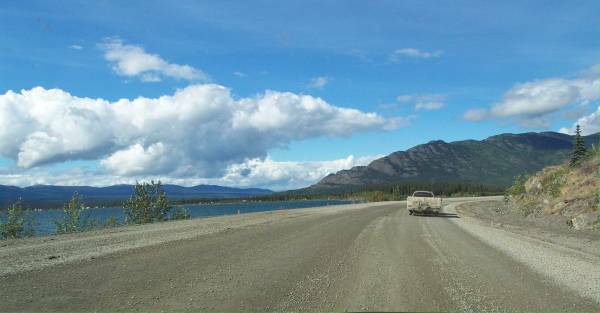 A gravel road along Teslin Lake, just outside the town of Teslin. Another look at the beautiful Teslin Lake. 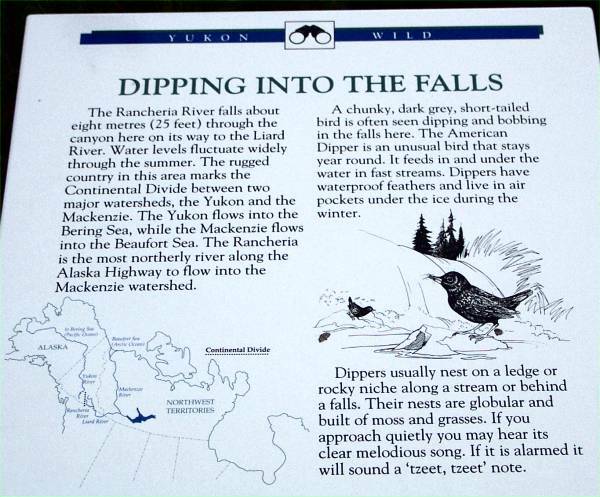 This is my first sighting of the Yukon River! 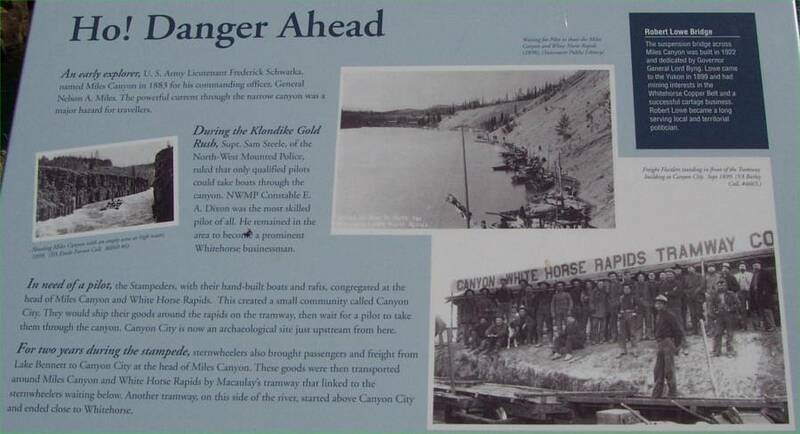 This panel expresses the dangers of Miles Canyon, located a few kilometers southeast of Whitehorse. 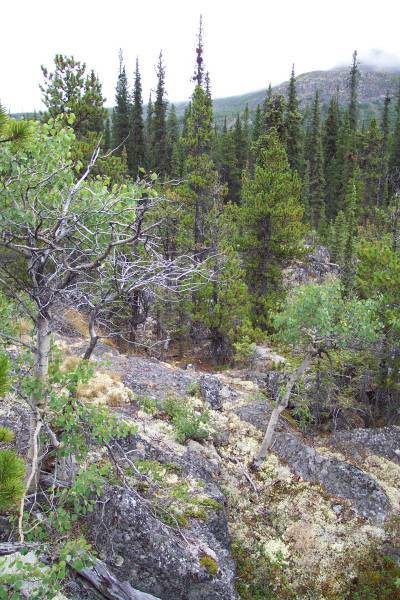 Miles Canyon, looking southeast. The water was a bit turbulent. I crossed the river on a suspension bridge and took this picture of a tour boat going through the canyon. This shot is also looking southeast. Further up this spur road was this overlook providing this wonderful view of the Yukon River and eastward towards Grey Mountain. A look southeast towards Miles Canyon from the overlook. 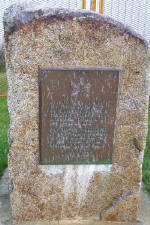 This monument marks the location where on April 1, 1946, the "United States Army officially handed over the Alaska Highway and associated facilities the the Canadian Army." 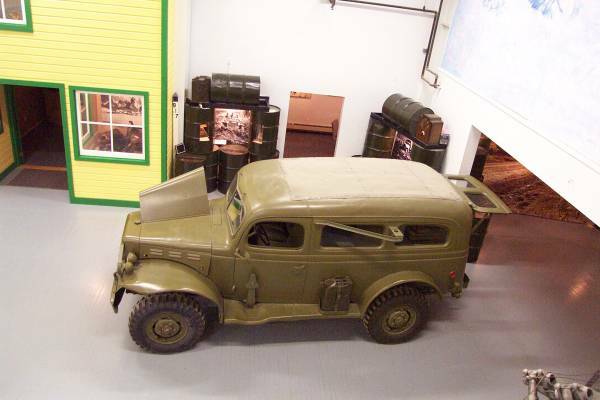 Inside the Yukon Transportation Museum. Many different facets of transportation are represented here. 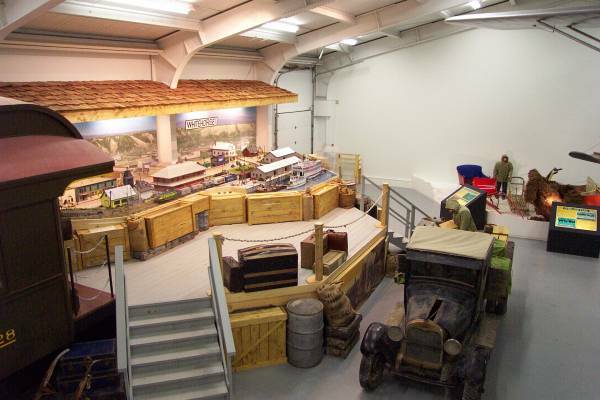 A full size passenger train car, as well as scale model trains, are on display. 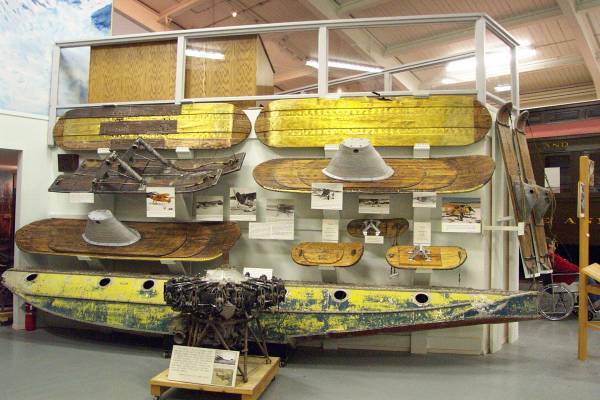 Skis used by bush pilots. 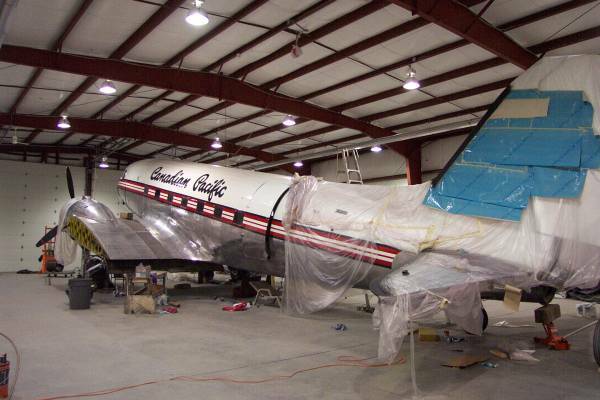 this is the DC-3 wind vane being refurbished. 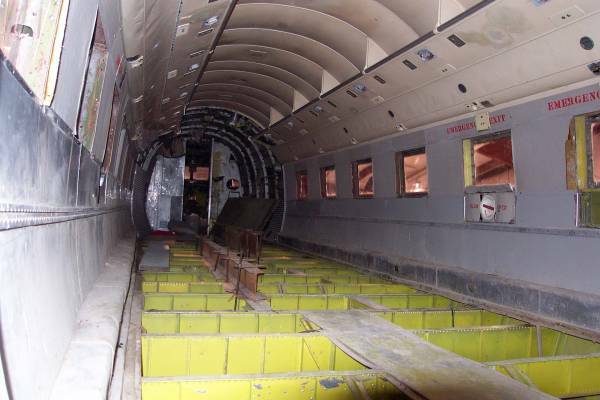 A lose look at the left fuselage. Part of one of the wings. 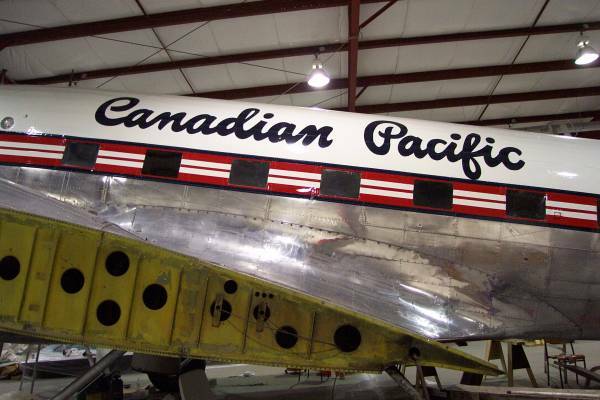 Aircraft number on the wing. 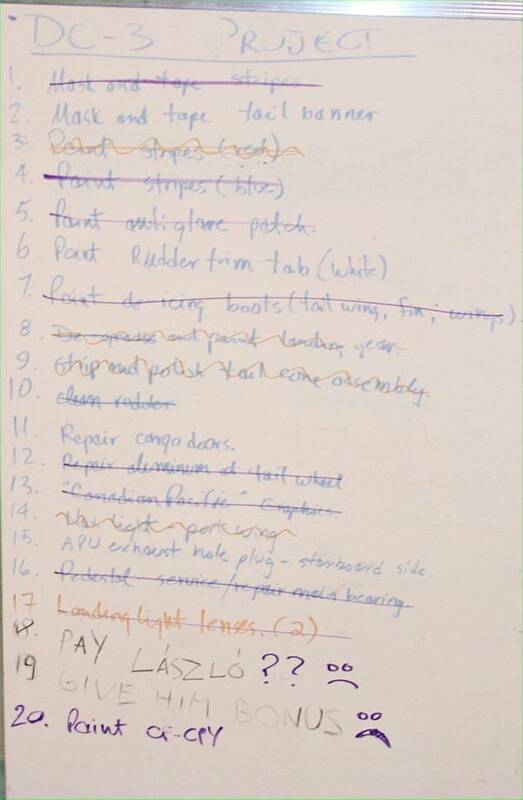 Laszlo, the person performing the refurbishing of the aircraft, had his to do list! Looking at the wing struts. 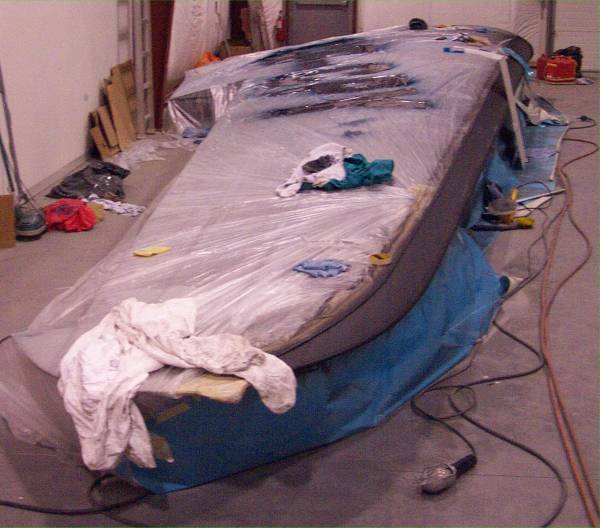 A look inside a wing that had been removed for repair. Looking forward inside the aircraft. 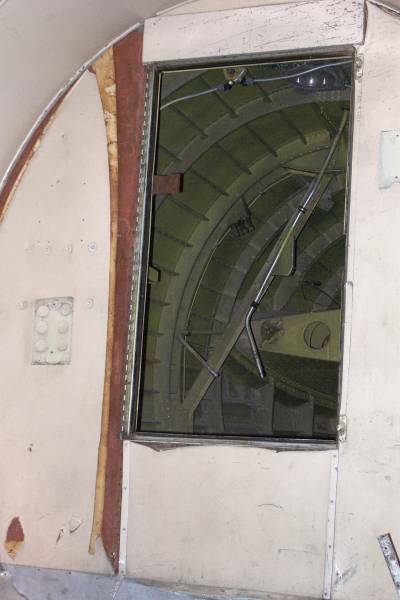 From inside the fuselage, looking into the tail section. 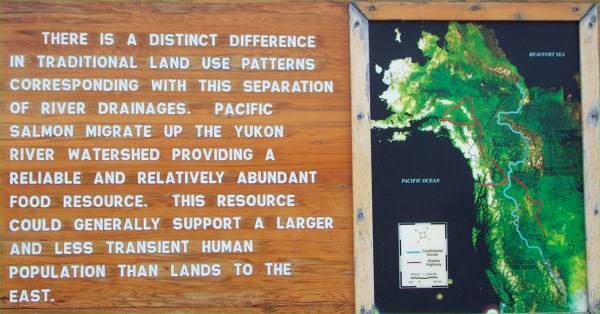 Tomorrow, I plan on a trip to Keno City, a town in the silver region of the Yukon, named after the card game. Should be interesting. Thank you for visiting, and I will get this uploaded as soon as I have a connection!